Japan will seek to build on progress in energy, defense and trade with its regional partners next month. In addition to Japanese Prime Minister Shinzo Abe’s planned trip to Latin America at the end of July, government sources on Thursday indicated that he will also make a trip through Oceania, visiting Papua New Guinea (PNG), New Zealand and Australia starting July 6. The trip will likely address three large Japanese concerns: energy, trade and defense. Abe will probably emphasize only one of these concerns in each country, although the others will come into play to a greater or lesser degree. As these issues are major pillars of Abe’s administration, finding regional partners and addressing their concerns will be a focal point for the government this summer. Abe’s visit to PNG has been rumored for at least a month, and would be the first visit by a Japanese prime minister since 1985. PNG recently completed a $19 billion liquefied natural gas project, and its first shipment set sail for Japan late last month. A new investment deal between the countries went into effect in January, allowing Japanese businesses to operate under the same rules as domestic companies. Abe is expected to meet with Prime Minister Peter O’Neill – although this will of course require O’Neill to overcome his current problems – and to call for “further improvements in the business environment to encourage Japanese business ventures by allowing greater ease in making investments and starting corporate activities in the country,” according to the Yomiuri Shimbun. The LNG project will supply four main customers in China, Japan and Taiwan, and Abe will want to ensure a smooth beginning to the partnership as Japan’s dependence on natural gas imports increases. He is also expected to address maritime security during his visit. While Abe’s visit to PNG looks to reaffirm deals both countries find beneficial, his visit to New Zealand will likely be more difficult. Prime Minister John Key, who is currently in Washington D.C., said on June 19 that “Japan should be cut out of Pacific trade talks if it will not open its markets to more farm imports,” Reuters reported. On May 28, six major U.S. farm lobbies said the same thing, claiming Japan should be suspended from Trans-Pacific Partnership (TPP) discussions if it did not bring down tariffs on its protected agricultural sectors. Key argued that giving Japan concessions on its agricultural goods could “lower ambitions” for reforms in other sectors like intellectual property rights and state-owned enterprises. Becoming a member of the TTP agreement is a major goal of Abe’s administration, although it faces tough resistance from significant portions of Japan’s voting public, particularly elderly people who own the majority of Japan’s farmland. Abe appears to have a piecemeal answer to this dilemma, at least for right now. His government is considering allowing non-food companies to raise their share in agricultural companies from 25 to 50 percent, in order to reduce the power of JA-Zenchu, which represents most of Japan’s agricultural cooperatives and opposes participation in the TPP. However, this may not be enough progress to appease Japan’s U.S. and New Zealand partners, especially since the government has indicated that it doesn’t plan to submit a revision of the law on the role of cooperatives until the Diet’s session next year, according to Bloomberg. Australia, like PNG, should be an easier visit for Abe. The two countries signed a free trade agreement in April, improving investment and opening up their automotive and beef industries (which is highly protected in Japan). Last week, they also agreed on a bilateral pact to jointly develop defense equipment, and Australia’s Foreign Minister Julie Bishop and Defense Minister David Johnston voiced strong support for a greater Japanese role in regional security during talks with their counterparts in Tokyo. As Australia has recently shown itself to be a valued supporter of a more normalized Japanese military posture, Abe will most likely use this opportunity to attempt to increase exports of Japanese military technology (recently approved by the LDP dominated Diet) and strengthen security ties. While maritime security will feature during the entirety of Abe’s Oceania tour, Australia will be the country where he will likely see the most traction on this issue. Australian energy imports will probably also be discussed, but PNG’s new LNG facilities are very attractive to Japan right now as it seeks to increase imports in this segment of the natural gas sector. 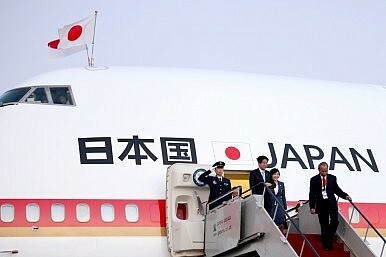 New Zealand will be the most difficult part of Abe’s trip. The TPP is a very important deal for Abe, and he will want to show the Key government that he is making progress on it. However, Abe’s ability to actually drive reform deep enough to satisfy the other TPP participants is questionable at this point. Most likely he will seek to find common ground with New Zealand as it arises, while reassuring Wellington that his agricultural reforms are proceeding with all possible speed. Time for Japan to Recalibrate? A much-touted bond with the U.S. president has left PM Shinzo Abe largely empty-handed.